The First Scandinavian Church was founded in 1883. It held its services in Norwegian. 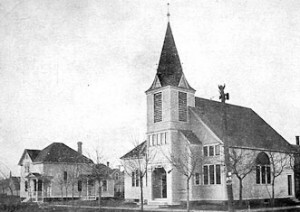 The Swedish population left the church because of the language used for services and formed their own church on August 1, 1891: the Swedish Baptist Church. The members of the Swedish church were A.J. Solestrom and his wife, Nels Johnson and his wife, Mrs. Anderson and her two children, Charles Wiklund and his wife, Lars Loren, Annie Nelson, and C.A. Hedlund. Before a church could be built, the members met in a building that had once been a saloon. Unfortunately, before the first church could be used it was destroyed by the fire of 1893. By that time, they had 60 members and the pastor was ON Lind. They rebuilt the church for a cost of $5000 and it was located on the northwest corner of Third Avenue and Fourth Street North.